This weekend I was really missing Grand Turk. I was looking at the blog posts from last year. This week a year ago we were spending our last weekend on Provo at the Grace Bay Club, we then had our last dive on the Bohio Wreck documenting the shipwreck site, and my last issue of the Astrolabe was due. I miss the beach. Actually, I miss the water. Actually, I miss swimming. And really, what I miss is snorkeling and killing lion fish. 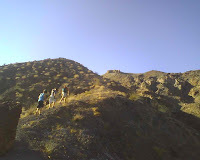 So, Sunday evening we packed water and decided to hike to the top of the ridge trail that we have been on four times up in the Coyote Mountains. 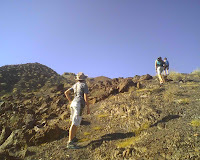 We decided to hike up to an large square rock outcropping that we call the fort. We have come across this trail on several hikes. We now call it Deneen's Pass, for reasons that I can't write about because Deneen got mad that I use her as an antagonist in my writing. But lets just say that "pass" would be a reference to the 1970s game show Match Word and not a reference to say Donner Pass or Sonora Pass. In the cool of the evening we began our hike, with the intent of making it a fast hike. In the first thirty-five minutes we had hiked a mile in and a half mile up. Not bad. And not far to go. After a ten minute break we evaluated. Do we really want to go to the top? We had made it this far before. And from here Davis had run up to the fort. This hike was a little harder, and a little longer. Ok, we made the fort. "Let's just see what's beyond the next ridge." After a ten minute break we evaluated. It did not look far to the next landmark. We have hiked this trail four times. We always talk about whether it is a very old Indian trail, or possibly a big horn sheep trail, or according to Martin, "just a hiking trail." At the top, the trail opened up to a wide, flat mesa of desert pavement that overlooked the valley below. In the center of the mesa there was the remnant of a geoglyph. The end of the trail was a shaman ceremonial site, and in fact, there was a discernible spiritual feeling in the landscape. 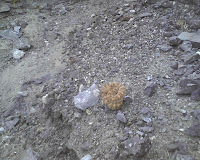 On the way back down the mountain we came across our first rattlesnake. Cool huh! Well, it's no lion fish. But it will have to do. This was a pretty good day. Only some of your pictures blow up to full size when clicked. All of them used to. None of these on this post do. Not sure if you're sending up some lower resolution shots, or if there's a change in the way you're posting them. These were all pictures that I took with my phone and then emailed to myself, but that does not seem to be consistent either.